After having been quite frustrated with my Tubescreamer-like SRV Special that was one of my first builds ever, i decided to give the old TS circuit another try. 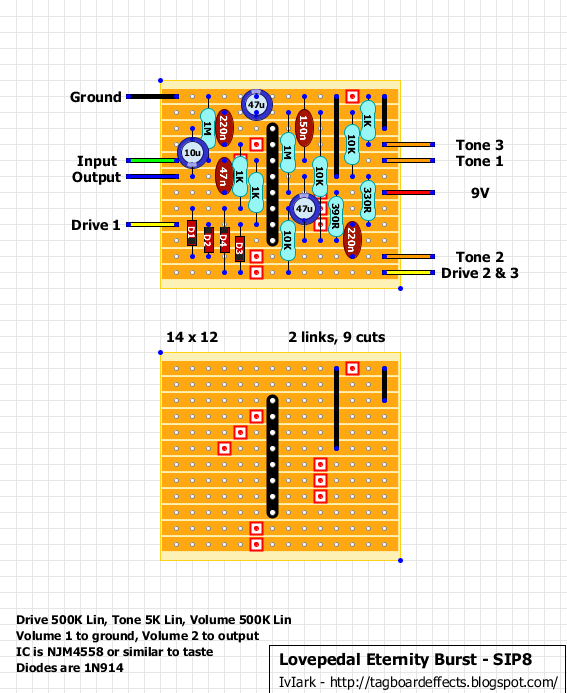 This time I chose the Lovepedal Eternity (which is a tweaked TS circuit) for several reasons. Incidentally, I had all the necessary parts lying around, and since it was a pretty easy build, I decided to give this one a go. The Eternity is basically a TS circuit without input and output buffers and several tweaked values, making it sound fatter and more open. 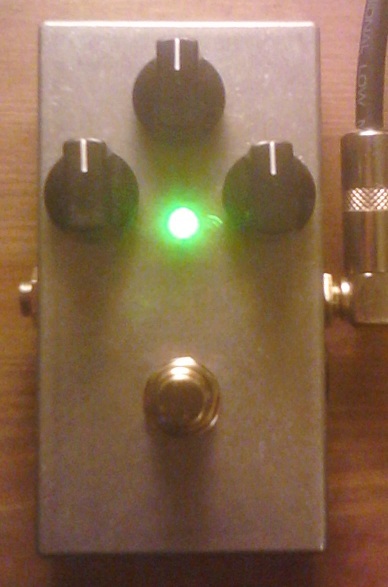 I managed to wire the board, drill the enclosure and finish the pedal in two afternoons. I used an Eddystone 1590B-sized enclosure (the original comes in a 125B, which is a bit bigger) and tried to stick to the original knob and LED layout. I like that look a lot. 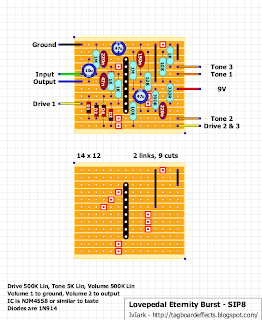 I found the 500kB pot for the gain to have an uneven spread. The gain would suddenly jump up at around 8-9 o'clock on the dial. I prefer a log pot here (500kA). The pedal is rather bright, i preferred a linear 1M pot for the volume. Because the volume control interacts with the output coupling capacitor, the 500k sounds much brighter than the 1M. The downside to this is, since the Eternity doesn't have an output buffer, it is influenced by whichever pedal comes after it. Because upping the volume pot increases the output impedance (ideally we want a very low output impedance) this dependence becomes more apparent. This is rather annoying so i resorted to using a 500kA and turning the tone knob way down (9-10 o'clock). Some Eternity versions have a 22uF output cap and a 100k pot. I might try that in the future. I'm planning on finishing the enclosure. I'm not sure which color I'll choose, I guess a burst finish would be nice, but that would be a little difficult. The LED is a 5mm waterclear green superbright. The Eternity also comes in white so maybe I'll try that.